Showing 5 articles from February 19, 2013. 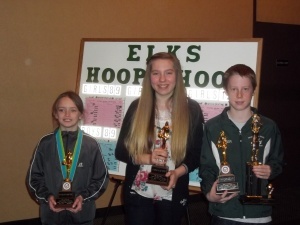 Walker Oblad won the state Elks Hoop Shoot. A major drug bust took place near Toledo Saturday as the result of an extensive narcotics investigation into South County, according to the Lewis County Sheriff’s Office. Lake A. Gregson, 23, and David A. Gregson, 48, both of Toledo, were arrested after deputies executed a search warrant on the 100 block of Conifer Ln., north of Toledo. Charles R. Reece, 37, of Castle Rock, is wanted by the Lewis County Sheriff’s Office and Kelso Police on suspicion of fraud and ID theft. Note: The Sheriff’s Office has since reported this warrant is no longer active. Households across the 19th Legislative District will receive a phone call at around 6 p.m. on Wednesday, February 27, and it will be from the district’s legislative delegation.